Alexander Hoer studied classical and prehistoric archaeology at Universität Heidelberg and Freie Universität Berlin. While studying he has been student assistant and tutor teaching technical drawing in archaeology and documentation of archaeological finds. Besides this he was student representative of the main committee of the Deutsches Archäologen Verband. In 2016 he was awarded a doctoral fellowship by the Berlin Graduate School of Ancient Studies and Topoi. 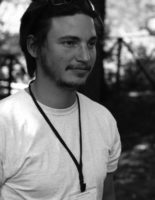 His research is part of the BerGSAS program “Landscape Archaeology and Architecture” (LAA) and contributes to Topoi`s research group (C-6) Cityscaping – Literarische, architektonische und urbanistische Modellierungen städtischer Räume. Alexander Hoer`s thesis aims to illustrate the historic settlement dynamics of Samnium within the last four centuries BC. Using a GIS, it seeks to identify spatial systems of location and architecture of the so called “hill forts” and to asees the Roman impact on the landscape following conquest.